What do you need to use ithlete? ithlete is compatible with most modern smart phones, tablets and even iPods. For Android the requirement is v4.3 or later. In practice this means most current Android models. If you’re unsure get in touch via email or Facebook and we’ll be happy to help. You will need a good quality sensor capable of reporting individual heart beats. You can use a HRM strap (compatibility list below) or most conveniently an ithlete Finger Sensor. Which HRM straps is ithlete compatible with? The Cardiosport Blue is recommended for use with for use with compatible devices. We have also tested the Polar H7 and Zephyr HxM Bluetooth Smart models, both of which work successfully. Some other models of Bluetooth Smart chest strap, such as the Wahoo Blue™, do not currently support the RR part of the standard and cannot be used to measure HRV with ithlete. Please note: These HRMs will need the ECG receiver in order to connect with ithlete. The ithlete Finger Sensor relies on an infrared light being sent through the fingertip to monitor blood flow. For this reason it can be sensitive to interference from bright lights. If you are finding you’re having trouble getting a reading, try turning your hand palm down or covering the finger sensor with the phone during measurement. Bluetooth Smart HRM Strap If using a Bluetooth Smart HRM strap please ensure you connect the strap directly to the app the first time of using. Pairing with the phone will not work, you need to open the ithlete app, select Bluetooth from the sensor choices and select your strap from the pop up list of detected straps within range. Upon opening the app next time, ithlete will automatically detect previously paired Bluetooth Smart straps within range. Please note: Bluetooth Smart HRM straps can only pair with one app at any time. If you have previously used another app please disconnect before attempting to pair with ithlete. View the Quick Start Guide. For ithlete the ECG receiver’s operating range is quite short, typically 8-10″ (250-300mm). This is deliberate so we can get the strongest signal to measure the precise position of each heartbeat, and also so that the phone display is visible to allow the user to follow the lung animation. View the Quick Start Guide. You can sync your device by opening your ithlete handset app, navigating to Settings -> Account login, then please enter the same login details you used for your ithlete Pro free trial or subscription and click login. Providing you have a healthy internet connection your handset will then sync to your Pro account, and you will then be able to sync your data. Readings will be uploaded to the cloud automatically, but you do need to press ‘Sync’ in ithlete Pro or refresh the browser so you are viewing the latest data held in the cloud. We recommend checking out this Tuesday Tip blog post for more information on looking after your HRM strap. We recommend taking your daily ithlete measurement first thing in the morning for two reasons; primarily to allow you to make informed decisions regarding the days workouts and also to avoid the influence of variable external factors (such as life/work stress, caffeine etc.). Some people like to do their measure as soon as they get out of bed, whilst others prefer to walk around, or do some light stretching as part of their morning routine, then do the measure. First and foremost, consistent measurements are more important than position. This is because each position appears to provide important data regarding training status. Therefore, pick a position and stick to it 100% of the time for your measurements to be meaningful. Switching positions from day to day will provide skewed data and affect daily ithlete colour indications. Most users should take their ithlete HRV measurement sitting down. If using the ithlete Finger Sensor measurements should always be taken sitting down with your hand resting on a hard surface. This is because research shows the strongest correlation with gold standard HRV measurements this way. If using a HRM strap, extremely fit endurance athletes and individuals with low resting heart rates (<50bpm) are advised to measure HRV in a standing position. Research studies have found that HRV is distorted when lying down in people with very low resting HR (50 and under). Standing (or even sitting) will raise this by a few bpm because your heart has to work a little more to pump blood uphill. However if you find this uncomfortable or would prefer to sit during measurements that is fine – just be consistent! To first establish your baseline we would recommend getting started with ithlete during a recovery/light training week if possible. However that is in a perfect world and we understand it is a lot to ask of fitness enthusiasts to take a week off! So ideally just avoid very intense workouts during that time. The baseline is actually a rolling average, so as you adapt and improve the average rises ensuring your change from baseline and daily training recommendations remain relevant to your current level of fitness. As baseline continuously adjusts, it is not a problem longer term if you start in an overtrained state; it would still guide you back to health without affecting your long term baseline and training recommendations. If you did suspect you were overtrained, then rest is needed anyhow, and the direction of the change will tell you whether you were sympathetic overreached (HRV will increase) or parasympathetic overreached (HRV will decrease). 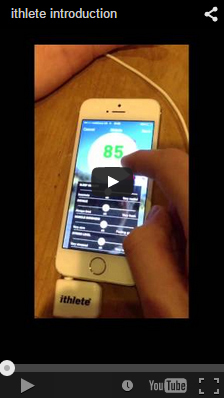 Each morning ithlete will provide you with a colour coded number (your ithlete HRV daily score). The colour refers to your change from baseline and recommended training. You will also see weekly and monthly change indications. This allows you to see whether your general trend is increasing (linked to increased health and performance) or decreasing (heading towards an overtrained state. In general, increases in HRV represent recovery, especially if the increase is back towards, or slightly above your baseline (the blue line). Slightly above represents super-compensation of course. Occasionally you may experience an increase in daily ithlete HRV score with an amber training recommendation. The system is then detecting a parasympathetic level much higher than baseline. In strength, power and sports requiring explosive efforts, this kind of increase is often associated with temporary sympathetic exhaustion, so the parasympathetic branch of the body’s regulation system is seen to dominate. Heart rate variability is a great measure of stress and not all stress is physical. Whilst you may be recovered from the physical stress placed upon your body from workouts have you considered cumulative stress? Cumulative stress is what HRV actually measures and is also affected by mental and chemical stress. So next time your HRV starts to decline but you feel ready for physical exercise you might want to think about your diet and life stressors. Why don’t I get the same measurement if I repeat the readings? If the HRV number decreases and / or the resting HR increases during multiple readings, then you are not relaxed enough. HRV is a sensitive measure of stress, whether physical or mental, and anxiety about the HRV reading will lower it. You need to think of your ithlete HRV measurement more like a blood pressure than an HR measurement (in fact heart rate variability and blood pressure are regulated by exactly the same parts of the nervous system). Many people have heard of ‘white coat hypertension’ – that’s when your blood pressure is higher in the Doctor’s office simply because you are anxious. That same anxiety or lack of relaxation will also lower your HRV. We strongly recommend doing one reading and not repeating without leaving a 5-10 minute break if you really think the first saved measurement was wrong. If you are disturbed during your first measurement simply select ‘Cancel’ during the reading and repeat the measurement. Why does the way I breathe affect my ithlete reading? Heart rate variability and breathing are intimately connected, and that is the reason we included the paced breathing animation to provide consistency in the measurement. The chosen breathing rate is based on highly respected research into the effects of breathing rate on HRV; however some people feel it is too fast for them, especially if they are practised deep breathers. You can choose your own breathing rate if you prefer, but HRV is a sensitive measurement, so keep it consistent from one day to the next, and never take HRV readings when breathing irregularly. The following quote is from Dr Liz Miller, a former neurosurgeon, psychologist & author (and ithlete user! ): “The emphasis is getting people to breathe right, which maximises HRV because breathing profoundly affects HRV – Heart Rate Variation is largely due to the changes that occur during breathing – breathe in – Heart Rate goes up – breathe out – Heart Rate goes down. These changes are healthy, normal and partly relate to the mechanics and partly to the autonomic (sympathetic and parasympathetic) nervous system. The greater the changes between breathing in and breathing out, the healthier and fitter your heart, lungs and autonomic system. In other words heart rate variability measures the amount your heart rate changes from moment to moment. Most of this difference is due to breathing patterns. Any change in mental state, even if you are an Indian meditation guru will change your pattern of breathing – the two are inextricably linked! Anxiety produces shallow fast breathing, calm produces slow deeper breathing. The slower and more consistently you breathe, the greater your HRV at any moment, up to a maximum that relates to your own personal fitness and gives you an ithlete number. Inconsistent breathing, even slight, profoundly affects HRV. Although most people learn subliminally that to get their best reading, they need to follow the animation on the screen, and breathe in a slow and measured fashion, it is possible to mess with your HRV by fractionally altering your breathing. This will happen if you are anxious, tired or otherwise stressed. From a user point of view – HRV needs to be a peaceful ritual. You sit and relax for a couple of minutes, watch the graphic on the screen and then when you are feeling calm, join in breathing with it and then when you are happy your breathing is nicely synchronised, switch on the device and measure your HRV.” You can also check out this Tuesday Tip blog post for more information on time how breathing affects HRV. Why isn't it picking up my heart rate signal? If the heart in the bottom left of the measurement screen stops beating then the signal has been lost. If using a HRM strap ensure that the skin contacts are moistened and that the strap is tight without being uncomfortable. Check the Quick start tips for your sensor type above. Which HRM straps are compatible with Precision Pulse? Works with ALL Polar HR belts (not WIND), Suunto Dual belt, plus many others. Precision Pulse is now fully compatible with Bluetooth Smart heart rate chest strap monitors. All HRM straps which work with ithlete are compatible with Precision Pulse. What is the ECG receiver's operating range? When using the ECG receiver with ithlete, you will need to hold the phone within about 12″ (300mm) of the centre part of the HRM strap due to the type of transmission used. For Precision Pulse the operating range is longer, typically 31-36″ (800-1000mm). This is typical for analog heart rate monitors that are sensitive to interference. Precision Pulse has an automatic gain control system to minimise interference when the receiver is close to the body, but you will notice the signal drops out temporarily as you move the phone away from the body quickly. It will re-establish after 2-3secs. The range achieved does depend on the type and quality of the chest strap being used. The Cardiosport model we supply as well as the Polar T31 models offer the best range we have seen. If you are having problems with range or interference and have a compatible device we would strongly recommend upgrading to the Cardiosport Bluetooth Smart HRM. If the tips above haven’t resolved the issue please contact us. We will usually get back to you within one working day. If you change your mind about your purchase, please return the unused goods to us with the original order reference within 8 working days from receipt and we will offer you an exchange or a full refund. This does not affect your usual consumer rights, including your right to claim a replacement, repair, or refund where the goods are faulty or not accurately described. Your contract with HRV Fit Ltd is regulated by the UK Consumer Protection (Distance Selling) Regulations 2000 and the Electronic Commerce (EC Directive) Regulations 2002.